TechnicBRICKs: Building Instructions for Jennifer Clark All Terrain Crane available! Building Instructions for Jennifer Clark All Terrain Crane available! It was in 2002 when the legendary Demag AC50-1, All Terrain Crane from Jennifer Clark was built and published at her website. Since then it became one of the most iconic fan made Technic models, admired by everyone. 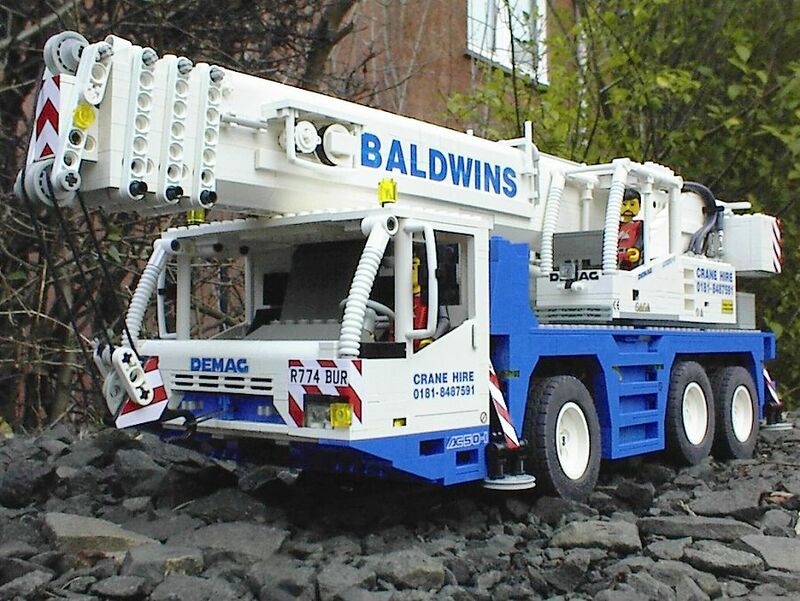 For you to have an idea about the dimension of the achievement we should also look at what was the official LEGO Technic mobile crane at the time - It was the well known 8460 first released in 1995 and later re-released in 2002 as 8431, and again the year after as 8438 (quite the same for a long period of time). This revolutionary model introduced at the time many breakthroughs and several custom parts that were never available for purchase, turning this model very difficult to reproduce and even more to make a digital model of it, suitable to transform into some sort of building instructions. Although and since Eric and Jennifer started produce building instructions for some of her most iconic models, about one and half year ago [1, 2], this turned into the next big thing most desired by many fans of Jennifer's old school models. In fact some were already dreaming with it even before than that, and the advent of the first instructions being released just catalyzed the man's will. After several attempts, elements replacement with easy to find current available alternatives (official or customized elements), compromises and many work hours, Eric was finally able to build on Jennifer, Richard Brown and Chase Horman's previous work and produce easy to follow instructions for everyone with access to a huge load of parts to build this amazing Technic masterpiece. But if you want to know the full story, better to read it here. Modifications included the replacement of several elements. The original and never commercially available Hi-Technic R/C receivers used by Jennifer, with current PF IR Receivers. And the custom lead-screws and thrust bearings used to lift and telescope the main boom with other alternatives for everyone without access to a machine shop - A long stroke linear actuator with built in motorization by Firgelli and a vulgar worm screw with a 32L axle. In the process many adaptations had to be done in the model to accommodate the new elements with different sizes and shapes. But if one carefully compare the original and the model in the building instructions you will find also several other minor changes that take advantage of newer elements meanwhile released by TLG, while the original aesthetics keeps preserved. For instance some 1x1 round plates in the rear lights were replaced with newer 1x1 tiles, newer light cover bulbs (58176) were introduced, etc. Even some red wedge plates were used in the counterweight to avoid the need of some custom stickers. You may argue this is not the same as the original thing, but these are the required compromises for being able to build it nowadays and to improve some aesthetic details. Even Jennifer admitted she would build it differently today than she did at the time. Of course I did not built the model in this short period since the building instructions have been released, although it is notorious a tremendous effort was spent to make them as clear as possible and to translate this complex and dense model into buildable steps easy to follow by any moderate experienced builder. And yes this model is almost dense as one can imagine a black hole, wasn't it packaging 7 motors (not to count the built-in motor in the Firgelli actuator, 4 IR receivers, 3 battery boxes and a fair amount of cables wiring everything inside. The only thing I missed was the introductory pages that we got used in the building instructions for Jennifer's models with a description of the real machine and its origins, and the model as well as the creative process behind it. But we have always the model presentation page at Jennifer's website. These 165 pages building instructions are now available from Chase Horman's MOCPlans building instructions market place. During the first month you can buy the BI for an introductory price of only $15, or a couple of giant stone coins fro Yap Island (if you deliver them...). Afterwards the price is expected to increase. Enjoy the build and add this remarkable model to your collection! Just a note: The yellow crane was released in 1995 as 8460 for the first time. A couple of years later it was re-released.